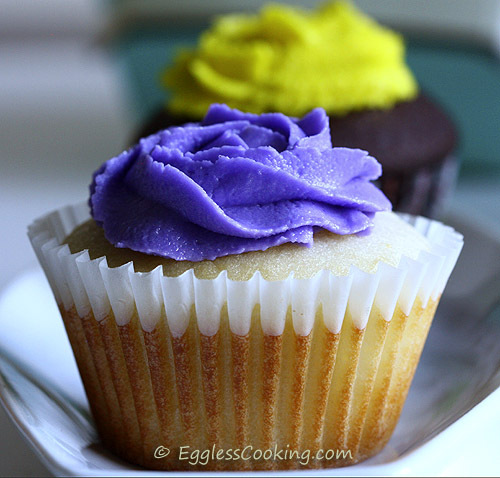 Eggless Vanilla Cupcakes: Eureka! Eureka! I'm very happy to let you all know that I have found something that I have been looking for the past 3 years. I really cannot contain my excitement! I guess you all are wondering what I'm talking about. If you were like me you too will join me to celebrate the discovery of an amazing recipe for eggless vanilla cupcakes. You guys cannot believe how many recipes I have tried so far to find the perfect eggless white/vanilla cake. Now I can confidently tell you that my search has ended. This is it! Many many thanks to Colleen Patrick - Goudreau for creating this awesome vanilla cupcake recipe. I found this in her Joy of Vegan Baking cookbook. I had bookmarked this nearly 2 years back but got a chance to try it only this week. I wish I had tried it earlier which would have saved me a lot of time and ingredients. I'm glad that I baked it at least now. As the original recipe is vegan, I substituted dairy butter for the vegan butter and 2% milk for the non-dairy milk. Other than that I followed the original recipe. I cannot wait to try the vegan version too. The version I tried with butter gave the cupcakes a very good buttery flavor. Other than the few minor changes I have suggested in the My Notes section, I wouldn't change anything else about the recipe. This is a keeper. Do try it and I'm sure you are going to get a ton of compliments. For the frosting I followed the vegan buttercream icing recipe but used all butter instead of shortening. Whip the egg replacer powder and 3 tablespoons of water, preferably in a blender for better results. Or just do it hand. The mixture should be frothy. Add the milk and 1/4 cup of water to the egg replacer mixture and stir it well. In a large bowl, stir together the flour, baking powder, and salt. Set it aside. In another bowl, cream the butter and sugar until light and fluffy. This may take upto 2-3 minutes. Add the vanilla extract and remaining 1/4 cup of water, and beat well. 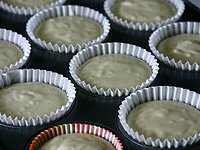 Fill in the muffin cups 3/4th full and bake for about 20-30 minutes or until a toothpick inserted into the center of a cupcake comes out clean. Mine was done around 24 minutes (See My Notes). Hands down this is the best eggless vanilla cupcake/cake I have ever baked. These vanilla cupcakes have a very soft, light and fluffy texture. Once you remove the paper liner you can clearly see the sponge like airy texture on the side of the cupcakes, just like you can find it on the usual cupcakes made with eggs. It tastes great too. This is a hit in our house. The only change I recommend is decreasing the quantity of sugar a wee bit especially if you want to frost it. The original recipe called for 1 and 1/2 cups of sugar and that's what I used too and we felt that the cupcakes were very sweet. So I would definitely recommend to scale it down to 1 and 1/4 cups, especially if you are going to frost it. I would increase the quantity of vanilla extract to 2 teaspoons. 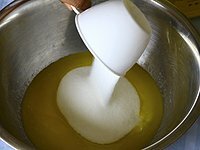 The original recipe mentioned to "just" mix together the flour and the egg replacer mixture with the creamed butter and sugar. I did the same (even though I was thinking at the back of my mind that I should not) and the batter had a lot of small lumps. Had I done that in parts alternating between the flour and milk mixture I could have avoided the lumps and would have got a smooth batter. 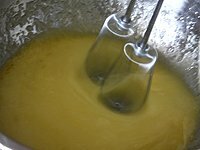 I was hesitant to beat the mixture further to dissolve the lumps fearing it would toughen the cupcake. I expected the lumps to dissolve while baking but it did show up in the cupcakes but fortunately, it did not mess up with the taste or texture. The toothpick came out clean at the 24th minute but I left the cupcakes in the oven for another minute or so, which I think slightly hardened the tops. But it softened after a couple of hours. Anyhow the next time I try these I will check for doneness around the 22nd minute itself. 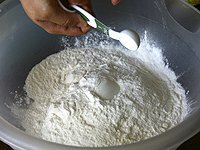 I'm also thinking of using cake flour instead of all-purpose flour when I try it the next time. I think it will give even softer cupcakes. The serving size mentioned in the original recipe was 10-12 cupcakes but I got about 15. Thank you very much for the cake recepies with egg replacer. Thank you very much Anusha. Will check the links. Hi can you tell me a substitute for egg replacer ? I haven’t tried this recipe with any other substitute Ansihika. Sorry. Thank you for this recipe. I just made the cupcakes since my daughter has an egg allergy. I have been pouring over so many eggless recipes. I normally use applesauce as a replacement but when I tried in cakes the middle tend to sink. The taste came out great. My family loved it. The texture came out spongy but sticky. When unwrapped it a lot of the cupcake was left on the wrapper and there were small holes. I can probably attribute this to maybe my oven as I know it doesn’t cook evenly, unfortunately. With the batter I made 1 – 6″ cake and cupcakes. The cake came out great, still with slight holes but it came out nice. Thanks again for the recipe! Thanks for trying this recipe Courtney. 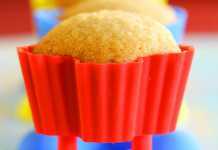 I spray the cupcake liners with non-stick cooking oil and the muffin/cupcakes peel off easily. Also let it cool completely before you try to get the cupcakes off the liner. Okay, I realized I didn’t allow for the cake to cool before I peeled off the liner because when we ate a few hours later it was PERFECT! The taste, the texture is EVERYTHING. We have some friends over last night and everyone LOVED it. I know I might be a bit dramatic but I am just so excited I found a great recipe for my daughter who has went to many birthday parties unable to eat cake. So today I let her indulge a bit. ha Thanks again! Your website is awesome. Oh yes you have to let it cool completely before removing the paper. Please be dramatic, your excitement is so contagious and I’m loving it. 😀 Thank you very much for taking the time to leave your feedback. I had the same initial experience. I used cake flour and it came out really spongy almost like angel food cake. I’m not sure if it’s the flour or just the recipe, but like you most of the cupcake is on the liner. The recipe said it buttered the liners for looks so I didn’t do that because the look didn’t matter too much to me. Also, I was thinking the egg replacer would work better if added to the sugar and butter bowl not the milk bowl since typically in baking recipes that is where eggs are added. I wondered if that would make a difference in the rise? Growing several hours from now when they are even more cool everything will be perfect like you experienced! Hoping, not growing :). I tried them out this morning and the texture is still like angel food cake but the cupcake does come off of the liner with some good pealing. I’m going to try these again to see if I can get it better next time! The flavor is great. Hi Can i use this recipe to make a cake? 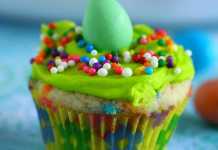 I am doing a Science Fair project with, How do substitutes for eggs affect a cupcake and you helped so much. I’m glad that this helped you. Thanks for the feedback. Dear Madhuram, I would like to try this recipe. But can’t find this egg replacer. What can I substitute for that? Pls reply. Thx. 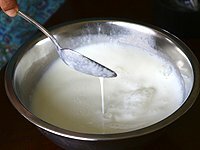 Hi Disna, I tried this recipe with yogurt and it didnt work out well. So I’m not able to suggest any other egg substitute for this particular recipe. My niece is allergic to eggs so I tried this recipe for the holiday. It was absolutely fantastic! For the first time she got to enjoy cake like all the other kids in the family! Instead of making cupcakes, I made two small round cakes. They both came out moist and delicious! Thank you for such a wonderful recipe! I’m very glad that your niece was able to have cake for the first time, Crystal. Thank you very much for sharing your joy with me by leaving your valuable feedback. I followed this recipe precisely. For me, it made 24 standard cupcakes AND a 6″ round layer! I’m not complaining. My young daughter is allergic to eggs, so I decided to start experimenting with egg-free cake recipes to prepare for her 1st birthday that is in February. I haven’t frosted yet, but I was dying to taste them. This cake is delicious!! My first experiment and we have a hit!! Thank you for this recipe. How to convert cups to grams please? 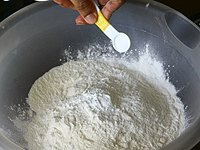 Please check this baking measurements page. These were so amazing! I really loved it, especially because I am allergic to eggs. Also do you have a recipe for eggless Brownies that include Ener-G? Thanks Abha. I don’t have brownie recipes using Ener-G. Check here for other eggless brownie recipes. 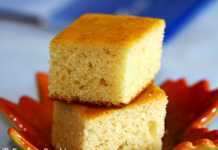 Please check my eggless cookies page and eggless muffins page. Would like to try this recipe but we don’t get egg replacement powder here. What is the best alternative substitute. Hmm…I have tried it once with yogurt and it didn’t work out Jenny. So not sure. 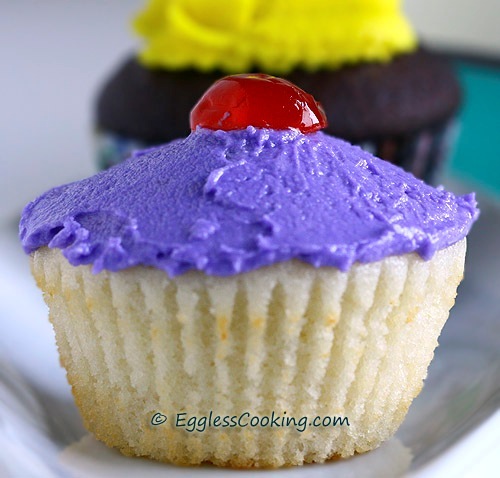 Why don’t you try this eggless vanilla cupcake recipe instead? After baking two days prior to my son’s birthday, can I refrigerate them before decorating or will they get hard. If I leave them outside they might go bad right. It will get a bit sticky is my guess. Maybe if you freeze them it would be better. Thank you Madhuram for the recipe! I tried it with buckwheat flour and it turn out to be the best cupcakes as ever. I have tried this recipe twice. The flavor is good but the texture is gummy. I don’t know if it is me or what. The only deviant was using whole milk and not 2%. The second baking I did use a different brand of egg replacer but got the same results. I can’t say that I will make this cake again. Hmm..I’m getting mixed feedback with these cupcakes. Some people get it right and some don’t. Guess I have to try it once again and see how it turns out. Hi thank you for the scaled down recipe, I’ve tried this two times. Both of them had very runny batter. I even didn’t add the half 1/4 cup water. 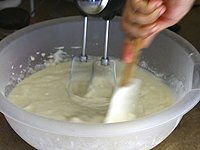 How does the batter consistency supposed to be? I was using GF flour, soy milk and vegan butter. I converted all of them into grams and ml. 140 gr flour, 55 grams butter, 150 ml milk…. My batter was a bit runny too. But I’m not sure if using gluten-free flour makes it even more runny. I tried baking cupcakes with whole milk instead of 2% milk. I had around 1 cup milk and eggreplacer mix leftover. Am I missing something there? We still liked the end result. If I bake it next do I have to add just 3/4 cup of milk. I guess I have to try this recipe again and blog about it because some of the visitors seems to be facing some issues while baking these cupcakes. Have to see what it is first hand. I thought I already answered this. Hmm…Yes you can bake it as a whole cake in a 13×9 inch pan or two 8-inch pans. A 13×9 inch pan would be perfect one big cake. https://www.egglesscooking.com/eggless-vanilla-cake-recipe/ This is the original recipe and I baked them into cupcakes. Thank you for reply so do you recommend that I bake this one as a whole cake or use the original recipe? The cake is for a friend’s birthday party and will have buttercream and a strawberry/ cream filling. Which one of your recipes would recommend? Thank you for your efforts. It’s basically the same recipe. The cake recipe uses condensed milk and the cupcake recipe I used milk and sugar instead of it. You can bake it as two 8 inch layers and can fill it with the strawberry filling and frost it with buttercream icing. I tried this recipie and made several trays but each lot turned out different. Why do I get a thick crust on the top of the cakes. I used Self raising flour and no baking powder . Is the butter weighed after melting or before and how much would this be in grames? Can you use oil instead ? Thick crust maybe because it was baked a little too long. 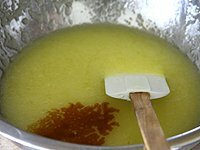 The butter is measured and then melted. 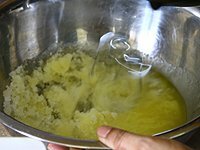 1/2 cup butter should be about 112 grams. That’s what I see in the baking chart I have got here. Yes, you can use oil too. My boyfriend has an egg allergy, so I usually use my tried and tested banana bread recipe which I convert with other fruit to make cake. Depending on the fruit, this usually works. But to get proper Vanilla cupcakes that don’t taste of something else, with that lovely springy soft centre… well, that’s a challenge. This recipe is a true gem! saved to my file forever! I tried baking these cupcakes & the eggless vanilla cake and refrigerated them overnight. Next day when I cut them, they were a little on the firm side. Is that normal? When I decorate them, should I put some sugar/water syrup in between the layers to soften them or not required? Will they be soft after a while? Storing it in the fridge will make it a bit hard. Brushing it with sugar syrup will make it moist. You can do it for better texture. 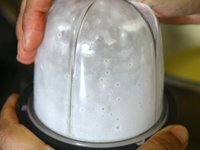 Would I double recipe if I want to make a 2-layer cake? This recipe should be enough to make two 8-inch layers. How long did you cook the 2 cake rounds for? I think it will take about 25-30 minutes.